Your history books say Germany’s monarchy has abdicated and there’s a king no more? Well, they’re not entirely correct. There is no one human soul blazoned with a crown anymore but Germany surely has its king – king soccer! Nothing is or ever was more popular than the game of 22 people chasing a ball for 90 minutes. Hardly a young boy who doesn’t at least kick around a bit in the streets and hardly a man who doesn’t at least sneak a peek at the league’s results. Nonetheless are women engaged in the game? The German women’s national team is the most successful of all and international competitions see an ever-increasing female ratio amongst spectators. We love our soccer and we’re well invested in it. 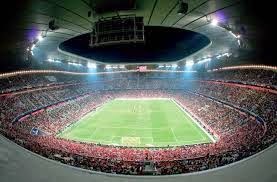 Season tickets for the league’s top clubs are passed on an inheritance basis and stadiums with over 80.000 seats and standing places sell out effortlessly when the biggies roll in. almost a reason on its own to go watch a game when in the region. But character wise other clubs beat it far and away. There is the ‘Punk’-club of Hamburg – FC St. Pauli which indisputably has the fans that will stand out the most with their pirate-like black and white, skull adorned fan gear and on the negative drag along the most violent ‘ultras’ (fans who are mistaking soccer for war). Maybe there was too much focus on out of play issues though as currently they didn’t make the premier league. name of ‘Yellow Wall’ as the club’s colors of black and yellow worn by the supporters turn the fan block into an impressive wasp nest like entity. Fan song and play with drums and supersize flags add to the experience and even the illegal smoke and pyrotechnics interludes can’t seem to be killed off by authorities. Beware though that fan behavior often is not as tame as much of its US football and baseball counterpart so taking along children is worth second thoughts.